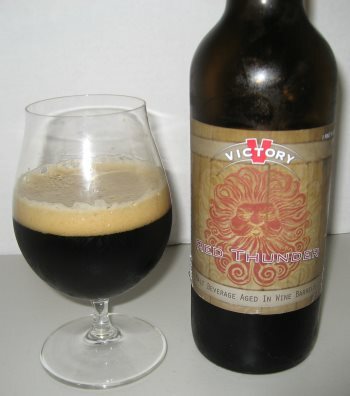 Red Thunder is the result of aging Victory Brewing Company’s Baltic Porter, called Baltic Thunder in once-used wine barrels. What you end up with is fine, mature, boozy porter with more refinement than you’d get from aging in whiskey barrels. The nose is super malty and sweet, with notes of chocolate. The middle has cocoa, plums, and figs, and the finish has some grape notes and a bit of smooth alcohol befitting an 8.5% ABV beer aged in wine barrels. The body is quite heavy, and there’s a nice dryness to the finish. This is a wonderful porter, and should hit right in the wheelhouse for fans of barleywines and big malty stouts. This entry was posted in Reviews and tagged Aged Ale, Baltic Porter, Oak Aged, Pennsylvania, Porter, Victory on October 8, 2013 by Xander. This summer seasonal from Victory Brewing is a blonde ale, light weight with a floral nose. 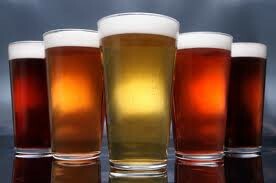 Once it hits your mouth, it’s all hops. Crisp, bitter, summery hops. Awesome, in a word. This is a fantastic, refreshing beer that will almost make me sad to see the last heat of summer fade away. I give it a 4.25 out of 5. This entry was posted in Reviews and tagged American Blonde Ale, Blonde Ale, Pennsylvania, Victory on September 7, 2011 by Xander.